In many ways, especially in weather, Newfoundland is the opposite of Jamaica. What brought you to Canada? How do you enjoy St. John’s? I ended up in Canada through my mom, she got a job working as a nurse here in St. John’s. I absolutely hate the weather here, but on the other hand the people are nice and welcoming, and the sights here are gorgeous. I first got involved in track and field over 10 years ago as it is very big in the Jamaican culture. I feel I was born into it as my dad was an extraordinary long jumper, so I guess it’s just in my blood. Do you have any pre-race superstitions or habits? I am a very superstitious person and actually have a whole pre-meet ritual. As for pre-race, I warm up roughly an hour and a half before my race, during this time I listen to my track playlist and keep to myself, talking to no one except occasionally my coach to go over my race strategy. Between the time of warming up until the moment I get into the blocks, I constantly re-run my race strategy in my head. What are your plans/ goals for the upcoming outdoor season? I plan to continue my pursuit in setting trends in the 400mh in Canada and constantly improve my times. I also intend to pick up the 200m again as it is my favourite event and I believe I can still run fast times. I’ll also find space to continue running the flat 400m. My main focus this season is the Canadian Track & Field Championships, but unfortunately as I am not yet a Canadian citizen I am ineligible to compete for Canada at this year’s World Juniors. You started running the 400mH last year, winning gold at the Canadian Legion Track & Field Championships. Is this an event we can expect to see you focus on in the future? Most definitely. Last year I went into the event hardly knowing how to hurdle, I had only ran the hurdles twice, including my win at nationals, which was the fastest time run at the championships for a number of years. I personally think that I can do much better than I did last season. To anyone that thinks that my time last year was my best, you’ll be in shock this season. What are your plans after high school? Are you looking to stay in Canada or go elsewhere with athletics? As of right now I plan on continuing my athletic career in Canada while pursuing a degree in university. I plan on going as far with track and field as my talent and hard work will take me. I enjoy playing FIFA, watching videos of past athletic events/races, and hanging out with my friends. 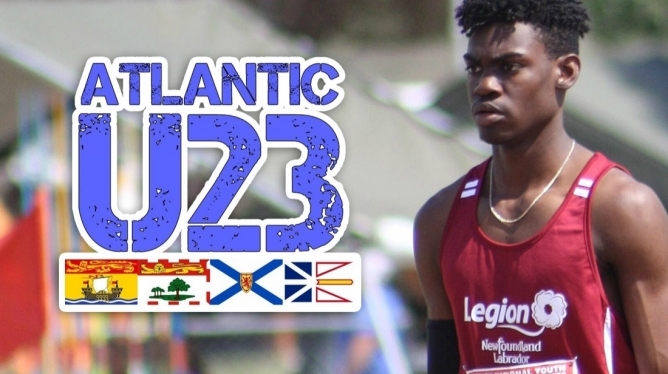 What are some of the challenges of being a track and field athlete in Newfoundland? Well first the weather is so bad that outdoor competitions can’t start until late in the season. During the indoor season my training group only has two lanes to work with and there are not enough competitions on the island to make the best out of your season. To get the competition needed to make progress, looking off the island is a must. Newfoundland and Labrador has been shut out of the athletics medals in the last two editions of the Canada Games. Is the 2021 edition of the Games an event you have your eyes set on? I fully intend on ending the drought of medals for this province at the next games. I feel that by then I will have even more to contribute which will make me an even bigger asset to Newfoundland than last year. 2021 will be an interesting year as the competition in my age group will likely still be strong, and probably even stronger than at the last games. All I can say is expect fast times and rivalries to carry on. So proud of you my son! The family is very proud of you my grandson. The sky is the limit! I have lived in Newfoundland When he speaks of the weather and difficulty of training outdoors he is not exaggerating. An incredible province full of incredible people, but you don't grow up soft there! Snow wind rain and hills like you will experience no where else. Way to go Josh! More fiyah! More fiyah!